My Kinda Town – The quit size is 42” X 52”. 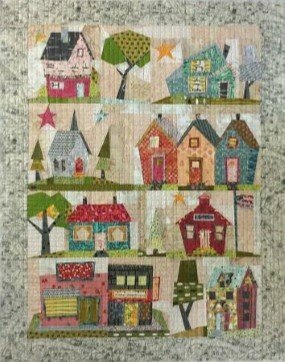 This is a fun whimsical town quilt. It can be made out of scrapes you might have or it can be planned. Whichever it will be fun building the town. Come have fun learning how to do freezer paper piecing. The benefits of this method are –you don’t have to tear off paper when you are finished stitching. You will truly appreciate this method once you have learned you won’t want to go back to the conventional paper piecing.